Is the Hilton big enough to get my 10,000 Fitbit steps in or will I have to hit the gym? Another weekend another set of updates to IBM Connections Cloud, one of which is a new look and feel to IBM Connections Cloud Meetings. 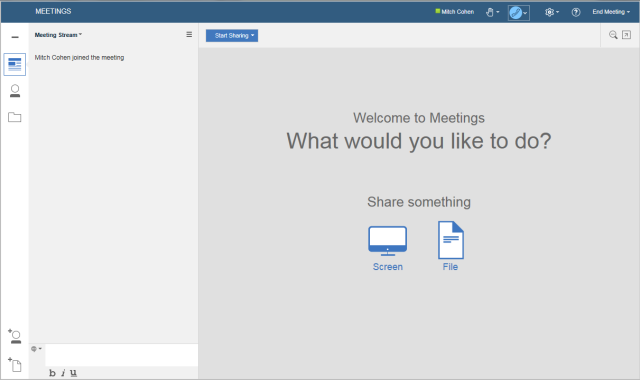 The Meeting UI has been updated to the Verse theme, and gone is the blank gray box which used to be prominent and it is replaced with quick actions to share your screen or files. Coming next is Audio/Video integration in Meetings, I have been beta testing it for a while now and happy to see it coming to release shortly. The name of the conference might change, but the traditions remain the same. The conference ends around 4:30 in the afternoon, but many many hours later Mat Newman finally has his badge removed and only then is Lotusphere officially over. The honor this year was given to Sandra Bühler. Gurupalooza is back again this year hosted by Susan Bulloch. If you are not familiar with this session it is many of the (non-IBM) speakers on stage, you ask the questions, and in theory you get answers. This is always a fun and informative session.